Someone, please go buy this! Someone is selling a 91 Prelude SI for 700 bucks, the reason it's so cheap is because it got t boned, so the door would have to be replaced. 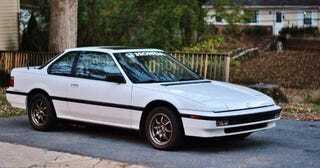 But Preludes have to be my 2nd favorite Honda after the Accords, so someone go rescue this from retards!